Great curb appeal! 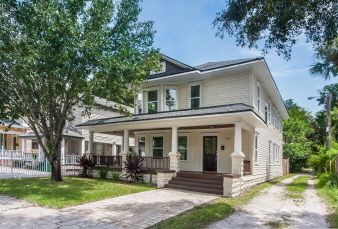 Built in 1911 & fully renovated in 2015 top to bottom! Charming home with 37 windows that let in natural light. Drink your favorite beverage on the wrap around porch as you visit with your neighbors. Kitchen features 42 in. cabinets, granite countertops, decorative backsplash, island, hanging potrack, stainless steel appls & wood-plank tile floors. Dining Rm is large & has beautiful wood floors & a chandelier. Living Room has bayed windows, elect. fireplace & art niches. Smartly designed with 1st flr bedroom with closet space & a Half Bath. Upstairs has 4 bedrooms, x-large updated hall bathroom & Laundry Room. Master bedroom is large w/lots of windows, walk-in closet w/custom org. system. Modern Bath features storage cabinet, shower & tub! Wood deck in fenced backyard.